First things first — I finished my socks last night, as I thought I would. I think I am going to debut them tomorrow, as they would look grand over a pair of black leggings. 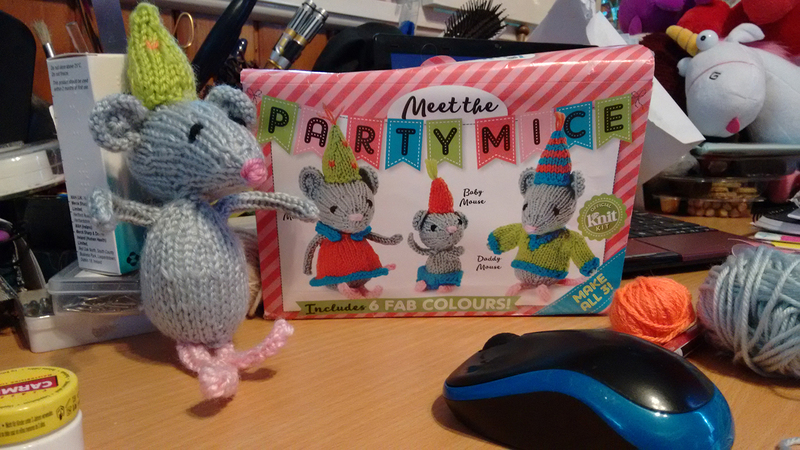 Secondly, as my cool-down project, I decided I would finish the poor mouse that has been languishing on my desk for… well, quite some time now. I’m reminded as I keep adding bits to it that I am not the most talented toy-maker… but that’s okay too. It just means that I need to keep trying my hand at it until I develop further competence. And really, handmade can be a little wonky, ’cause made with love. I’m pretty sure that I’ve got some sort of cold lurking. I was really shaky last night, and my nose was full of gremlins when I checked it this morning. I did a stellar job of doing as little as possible today, so hopefully I’ll be in reasonable nick for tomorrow’s planned playdate-picnic. I am looking forward to that, though like with most anything — not gonna be fussed if life interferes. Between being a spoonie and being an introvert, organised social events are really draining, even if they’re low-key and in a safe/neutral place. And really, there are three other things on the books for the next week. Knitting, of course, then Littler’s birthday, and then the village fun day. We’re not doing anything for the birthday besides your standard ‘have gifts and cake!’; maybe next year we’ll think about a little party. Having said that, Smallhausen and j will probably try to make some sort of playdate happen to celebrate. I think I remember her saying that the pair of them were very excited for Littler’s birthday. I know she told her entire class it was coming up, which is sweet.